Long before cell phones, long before cordless phones, the telephone was a bulky instrument that set on a desk or hung on the wall. There was only one phone company and you had one choice of color: black. I recently viewed a video that showed confused teenagers attempting to make a call on a rotary dial phone. However, when I was a young lad in grade school, Sapulpans did not have rotary dial service. You merely picked up the phone, the operator would say, “Number please,” and you would give the operator the number to be reached. It was rather like Mayberry on “The Andy Griffith Show.” No dialing, no pressing buttons, simply speak to an operator, (who was always a woman). My father’s business telephone number was three digits, 108. Many telephone numbers back then were only two or three digits. 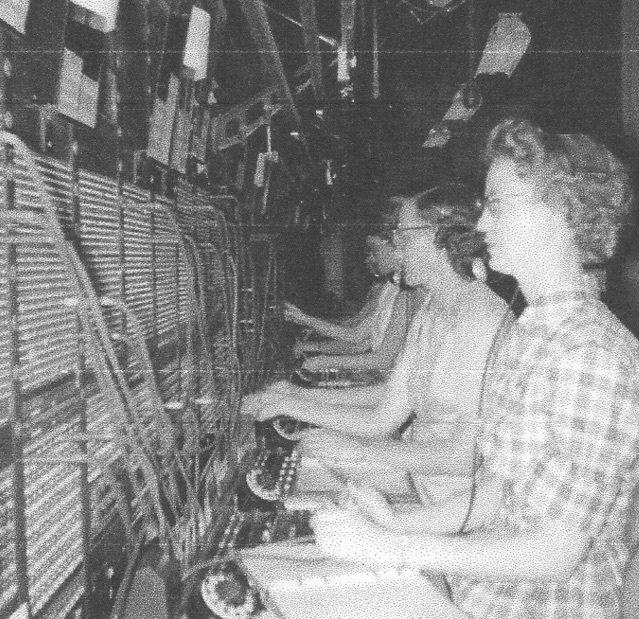 Sapulpa received rotary dial service in 1960. Every number changed to four digits with an alpha-numeric prefix, therefore my dad’s business number became Baldwin 4-0108. I learned to wait for the dial tone before I started dialing a number. In those days, when you called for directory assistance, you dialed the “0”, but you spoke to a real person, the “Operator.” The operator would request an address and a correct spelling of the name of the party you were trying to find. Often, the operator could not find the number, due to incorrect spelling given to them. Before call-waiting technology, you might get a busy signal. If the number continued to be busy, you could ask the operator to see if the other phone was off the hook or if it was merely busy. If it was an emergency, the operator could break into the call. If you left your phone off the hook for a protracted amount of time, the phone would start rapidly beeping. The operator also facilitated long distance calling. You could place a “person-to-person” call or a “station-to-station” call. A person-to-person call meant making a long distance to a particular person, charges did not start until that particular person answered. A station-to-station call was a long distance placed to that number, no matter who answered the phone. The charges started as soon as a connection was made. The operator also functioned as 911 operator would today. A person in an emergency would tell the operator to call the police or fire department. Another part of telephone history was the “party line.” A party line was a local telephone loop circuit that was shared by more than one subscriber. There was no privacy on a party line. If you were talking to someone, anyone on your party line could pick up their telephone and listen in. Also, if anyone on your party line was using their phone, no else could make a call, even in an emergency situation. There were laws making it mandatory for all parties to hang up if someone announced they had an emergency. However, it did not mean everyone complied. Subscribers could pay an extra monthly fee to get a private line. Eventually, switching office technology made a party-line obsolete. Before the days of computer hackers, in the days of analog telephony, there were “phone phreaks.” These knowledgeable nerds figured out how to generate the proper tones to initiate a free long distance call. One of the devices turned out to be a “Captain Crunch” whistle. When one of the holes was covered up and you blew into it, the whistle generated a 2600 Hz tone, which would trigger a remote “on-hook” signal. Last, but not least, another part of the “analog” days, was no caller ID. I remember making my share of prank calls, such as, “Do you have Prince Albert in a can?” When the business would say yes, I would say, “Then let him out!” And laugh! Being a clever little nerd, I was not content with such mundane humor. Once, I called one of the teachers in high school, disguised my voice (by placing the phone directly over my larynx.) When the teacher answered the phone, my routine was: “Hello, I am Ralph Snodgrass from Bell Telephone and we are conducting high-frequency sub-harmonic testing and you are not to answer the phone for the next two hours, while these tests are being conducted.” Of course, I would call back every few minutes, and when she answered the phone, I admonished her for answering the phone. There were also the “heavy breathing” (perv) calls made to girls. I can state unequivocally I never made these types of calls. This rotary phone was in the office of Betzler’s New and Used on Main Street for 15 years. Originally the number was 108, when rotary dial service was activated, the number became BAldwin 4-0108, which later became 224-0108. Photo by Lottie Wilds. Another aspect of telephone service back in the dark ages here in Sapulpa was that calls to Tulsa were long distance until 1969. That changeover coincided with the alpha-numeric prefix being discontinued. Therefore, Baldwin 4- became 224-. As you can see, we have come a long way in phone technology in a half century, and youngsters today have no idea what it was like to make a phone call back then or to have only one phone service provider. One might wax eloquent for the “good old days,” but I think today’s phone technology and its plethora of choices, is a godsend.